Description: Shell is up to 33 cm long. 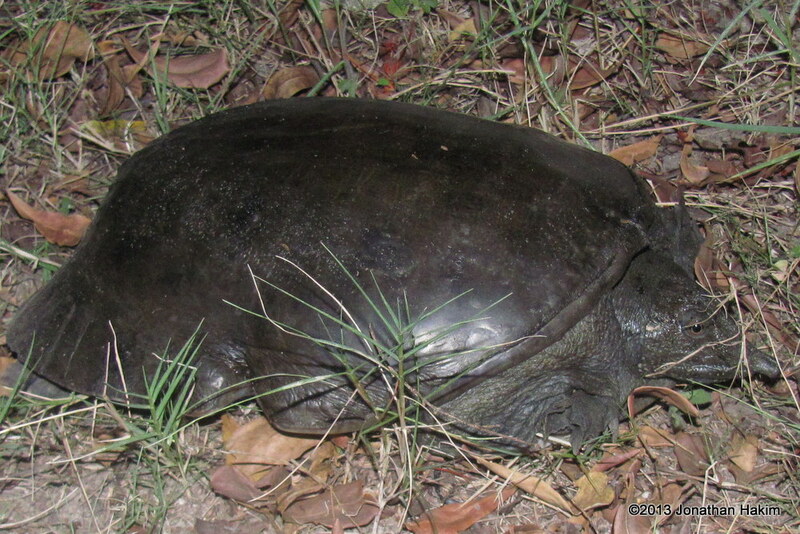 An average-sized turtle with a flat shell. 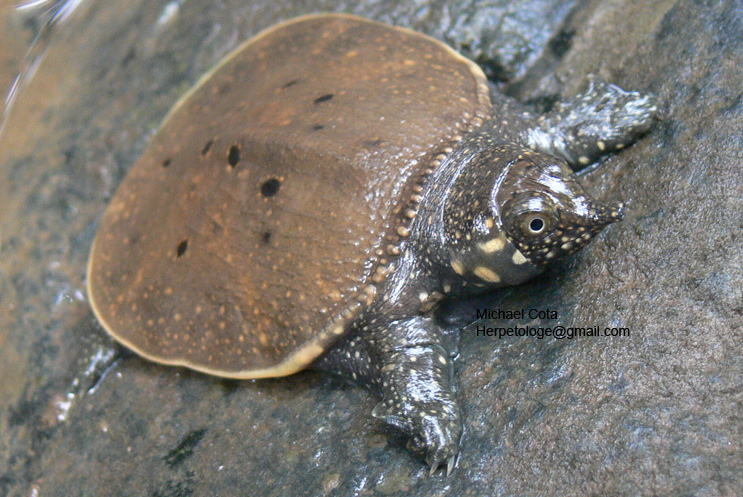 Like all softshell turtles, its shell has a soft, leathery appearance. The front edge of the shell has a single bump. 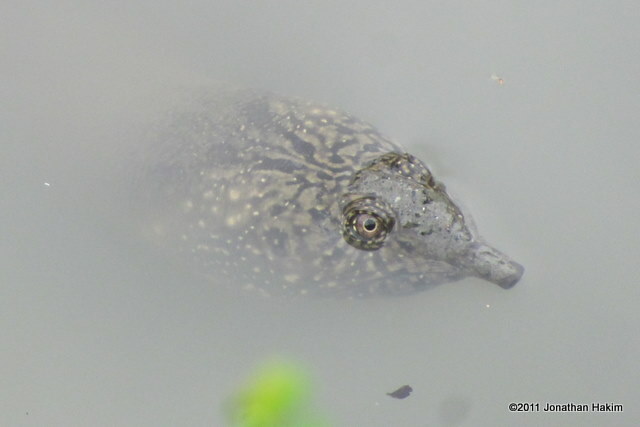 The head and neck are especially long and end in a tubular snout. The head and neck are light brown, sometimes with dark lines. Shell is grey, olive, or light brown. Underside of shell is cream. 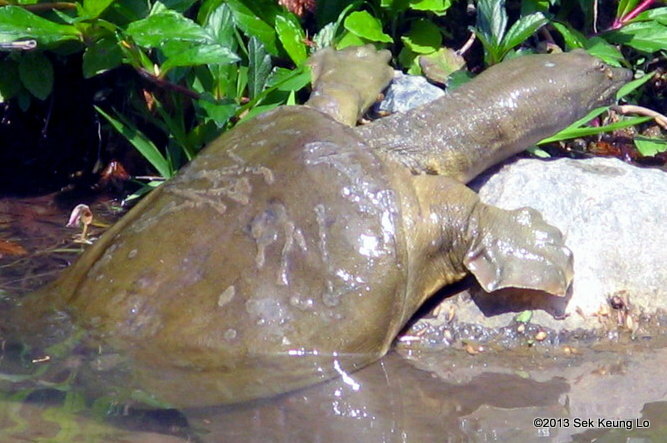 Similar Species: Asian Softshell Turtle is much larger, with a stouter neck and many bumps lining the front of the shell. 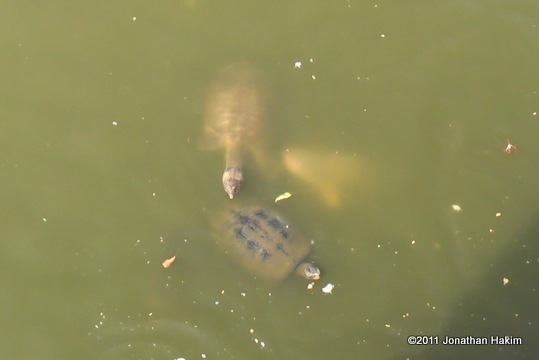 Habitat: Can be found in slow-moving water bodies such as ponds and lakes. Prefers waterways with muddy substrate. Contribution to the ecosystem: Eats fish, frogs, snails, worms, and insects. They provide food for monitors, and the young are eaten by birds and fish. 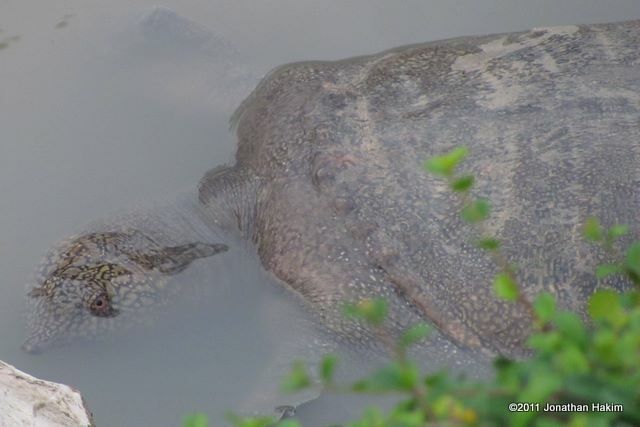 Danger to humans: This turtle is aggressive and bites, but is not seriously dangerous to humans. 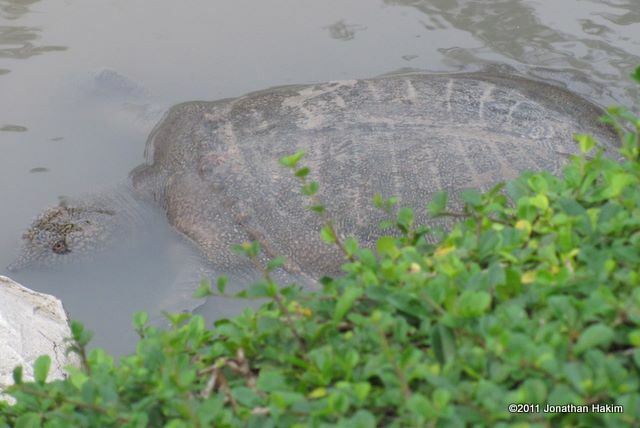 Conservation status and threats: The Chinese Softshell Turtle is not native to Thailand, but has been introduced for food production and because of released pets and merit release. 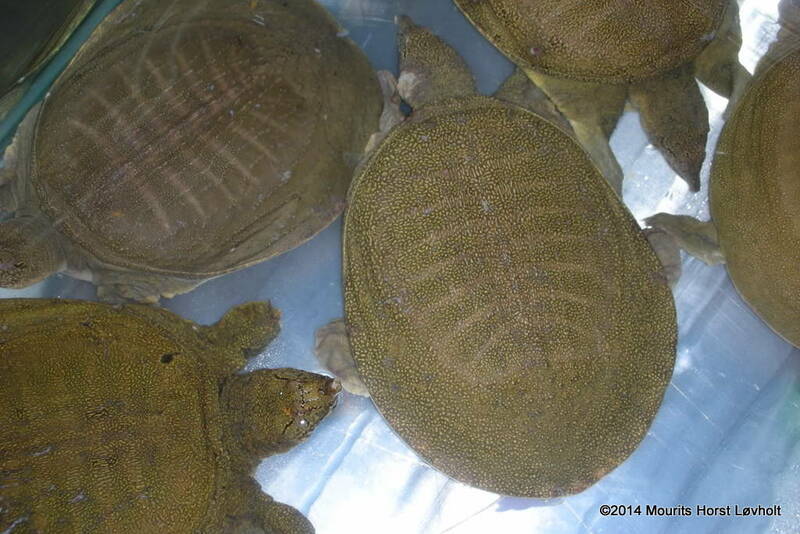 Over 100 million are sold from Chinese turtle farms every year. 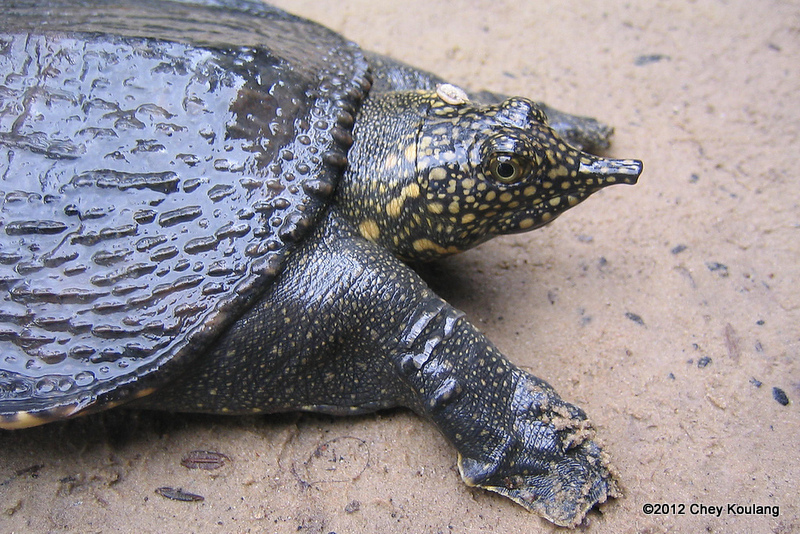 It grows faster, matures earlier, and lays more eggs than native softshell turtles, which could lead to it outcompeting native turtle species. It has also been introduced to other southeast Asian countries, Guam, and Hawaii. 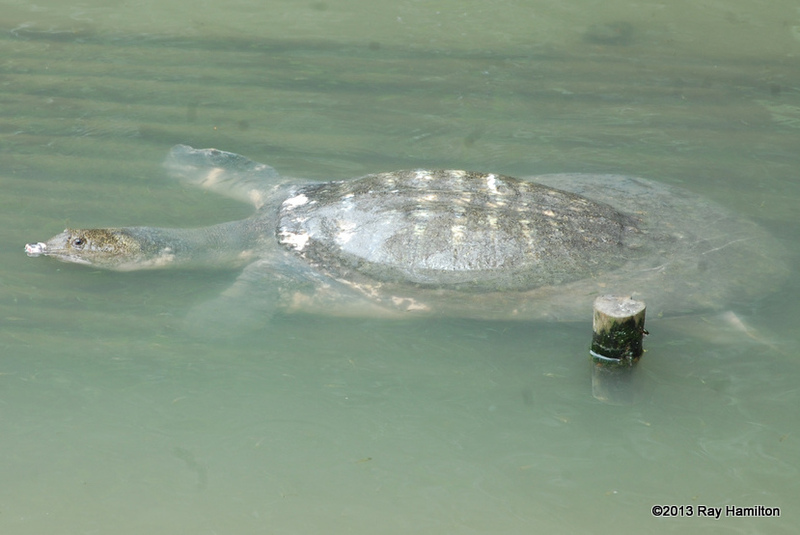 In its native countries of Korea, China, and Vietnam, it is considered “Vulnerable” and its numbers are decreasing due to the hunting of the turtles for food. 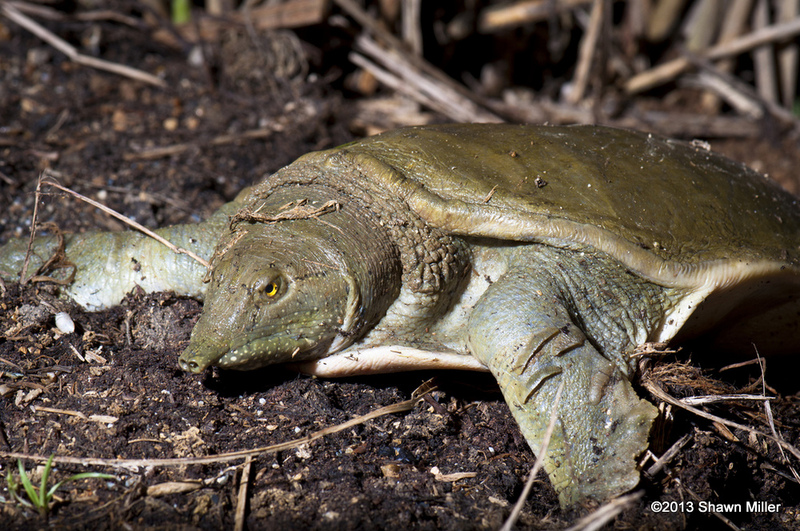 Interesting facts: Softshell turtles have a range of adaptations that give them a quite different appearance than other turtles. 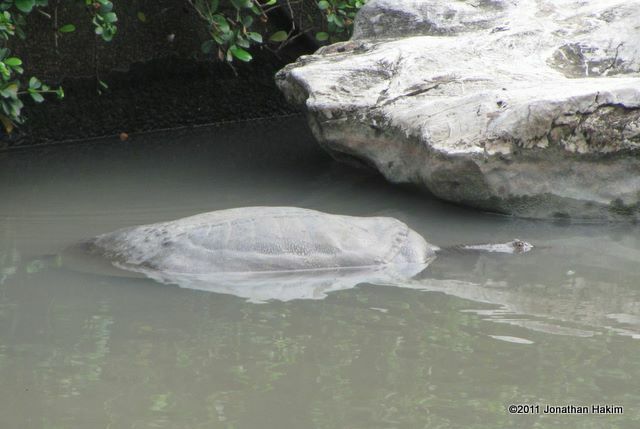 Their soft, flat shell is lighter and more streamlined so they can chase their prey through the water. 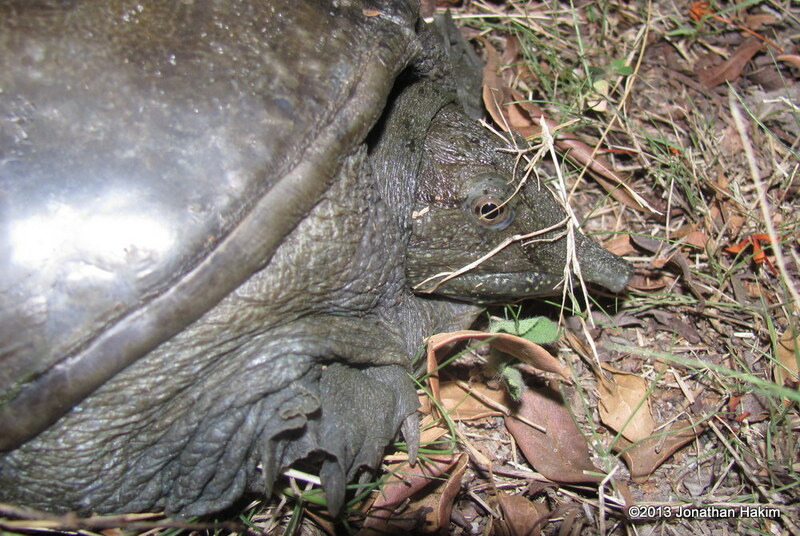 The flat shell also allows them to bury easily in the mud. The long neck and narrow head can move quickly to grab prey in the water, as well as reach up to breathe while exposing none of the body. And the wide, flat feet act like paddles to propel them through the water. Description: Shell is up to 83 cm long. 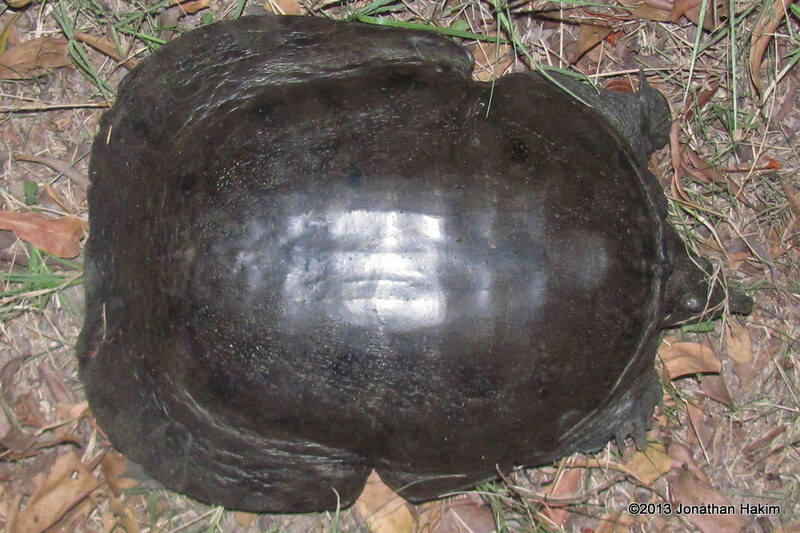 A very large turtle with a broad flat shell. 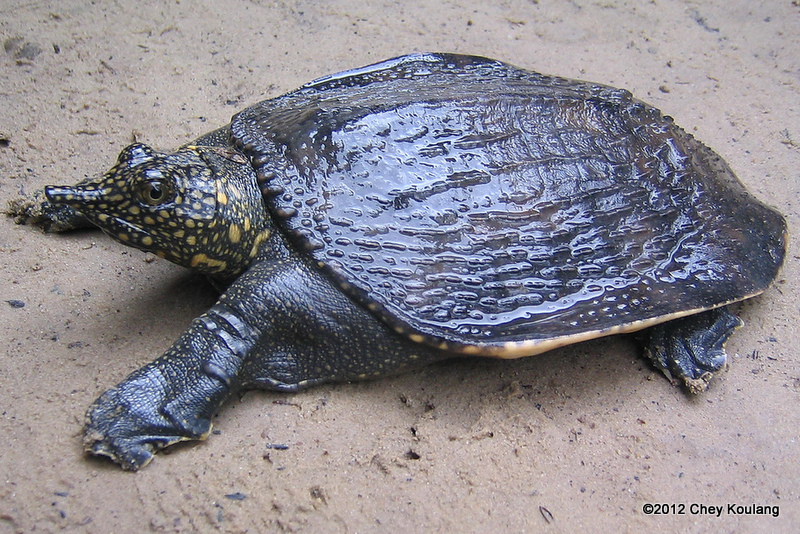 Like all softshell turtles, its shell has a soft, leathery appearance. 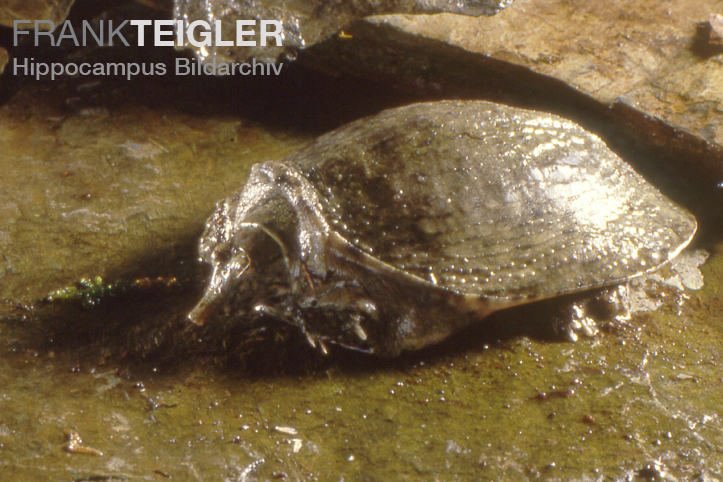 The front edge of the shell has a series of bumps, which help to distinguish it from other softshell turtles in the region. The head and neck are long, and the mouth is narrow and tubular. The head is dark with yellow spots and splotches. Shell is olive or brown to black with tan and yellow spots. Underside of shell is white or pale grey. 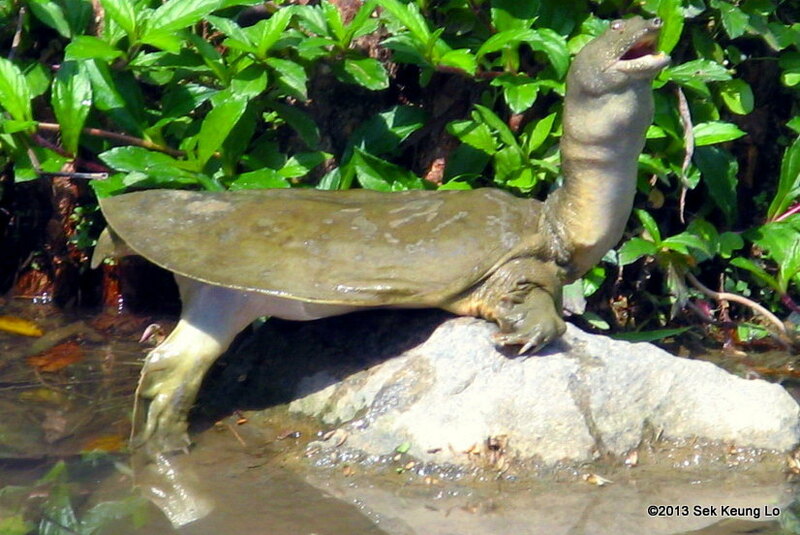 Similar Species: Chinese Softshell Turtle is much smaller, with an extremely long neck, and only has one bump on the front edge of the shell. 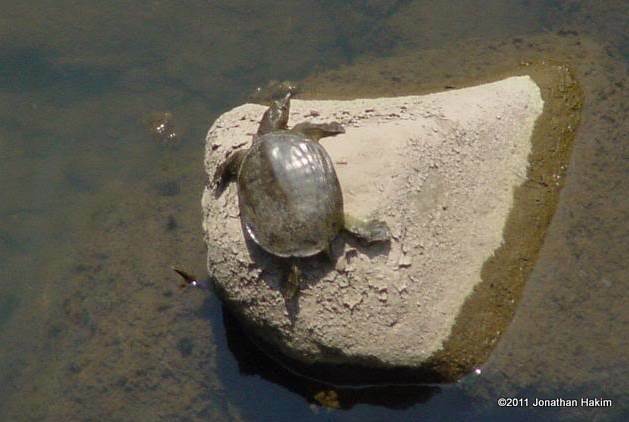 Habitat: Can be found in streams, rivers, lakes, swamps, canals, and park ponds. Prefers waterways with muddy substrate. Contribution to the ecosystem: Will eat almost anything, including fish, frogs, crabs, shrimp, insects, aquatic vegetation, and carrion. Their young and eggs provide food for water monitors. Danger to humans: This turtle has a large head that can give a painful bite, but will not do any real damage. 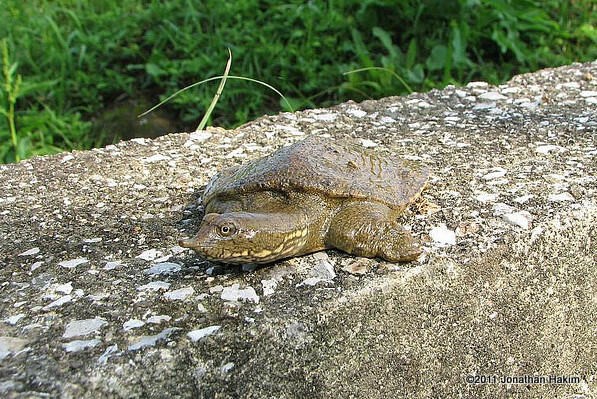 Conservation status and threats: The Asian Softshell Turtle is often caught for food and for traditional Chinese medicine. It is listed as “Vulnerable” by the IUCN Red List and is on CITES Appendix II.